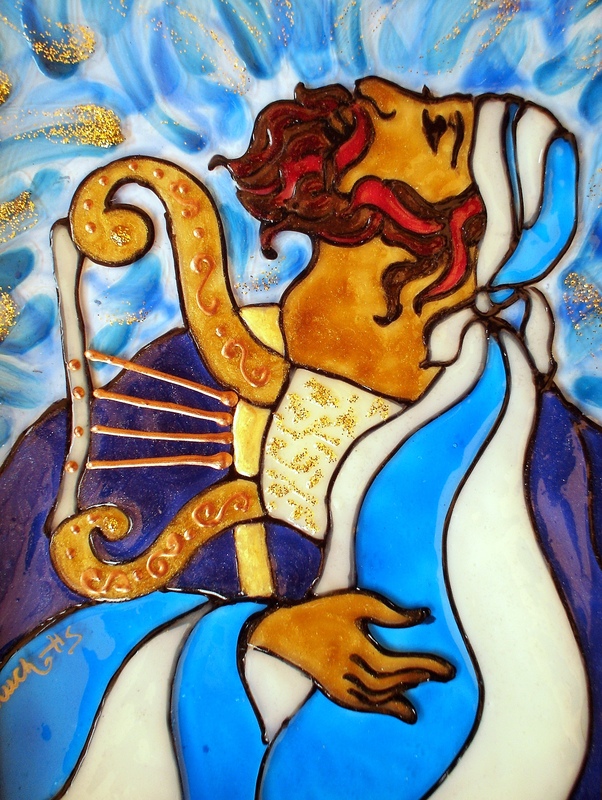 Typically, "Jewish" Art tends to dwell on the side of sadness and dark despair and rightly so, we have had a long history of tragedy and hopelessness; however Judaism is also about the joy, hope and fulfillment of the long awaited promises found in the Torah and the prophets. My paintings are visual narrations based on the rich imagery of the Scriptures filled with joyous expectation and hope of Divine deliverance. "I delight in the Land of my Heritage. I celebrate the vibrant life force of the Jewish People and my inspiration is born out of our steadfast refusal to perish among the flames of annihilation, persecution and peril. I rejoice in our triumphant and joyous return to our ancient Biblical homeland and I am awed by the enduring spirit of a people who won't give in to defeat." Although trained in traditional painting techniques such as oil, acrylic and watercolor, Hilary chooses to paint her images on a canvas of glass with untraditional techniques. She combines metallic paint with an acrylic based textured translucent paint. Hilary employs untraditional media as she elevates it to fine art due to her strong sense of composition, design and emotive imagery. The textured paint is a viscous paint medium that can be manipulated to create lush luminescent effects and it combines well with the metallic paint to create richness, texture and a three dimensional quality. The interplay of translucent color, luminescent light and texture infuses Hilary's paintings with an energy and mood that changes depending on the quality of light be it morning sun or evening twilight. Hilary finds her influences in the playful imagery used by Chagall, the elongated elegant images of Modigliani and the jewel like iridescence of Klimt and she borrows on her training in illustration to tell her stories.